I’m always happy to have a new recipe for my NuWave oven, and I love Indian food. 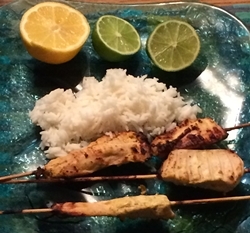 I’m not sure where I came across this recipe for Lean Tandoori Chicken Kebabs, but I had added it to my database at some point. It nicely covered both categories, so I decided to make it on a recent Saturday. The first thing I did was to make the marinade the evening before in order to give it a full 24 hours. That was the right thing to do. The chicken came out very flavorful. I followed the recipe for cooking times plus a couple of minutes, and I think it was a bit too long. The chicken was a tad dry. But I put both a lemon and a lime on our plates, and drizzling on the citrus made up for any dryness and added a little zing. The basmati rice on the side worked well. It made for a great Saturday dinner.